Alle with a baby alligator. Hello! My name is Alle Foster, and I am the Conservation Manager for the WAVE Foundation at the Newport Aquarium. I am with Ric Urban and Becky Echtenkamp from the Husbandry Department at the Newport Aquarium, and we are going on a very unique adventure over the next few days… and I am going to share it with you! When we are at work, a lot of guests ask us, “How do you get the animals at the Aquarium?” or “Where do the animals come from?” It is definitely a good question, and many people don’t realize that a lot of the animals are “on loan” from other accredited zoos and aquariums around the United States, and sometimes we have to travel to pick up (or drop off) these different animals. So Ric, Becky and I are on a trip to Tennessee, Georgia, Florida and South Carolina to drop off, and pick up, some of our amazing animals. And of course we end the trip with picking up Bravo, the more than 600-pound, nearly 85-year-old Galapagos tortoise! Over the next few days we will be posting about our adventure and sharing all the fun and unpredictable aspects of our trip! Day 2 and 3: Atlanta and Valdosta, Ga. – and half of our mission in St. Augustine, Fla.
Hello again! Since we left a day early, that gave us more time on the road before sticking to our planned schedule. So we stopped at Zoo Atlanta on the way to Wild Adventures in Valdosta. I am quickly learning that Ric knows everyone in the Zoo/Aquarium industry! He has friends all over the United States, and those friends have been very good to us on this trip. 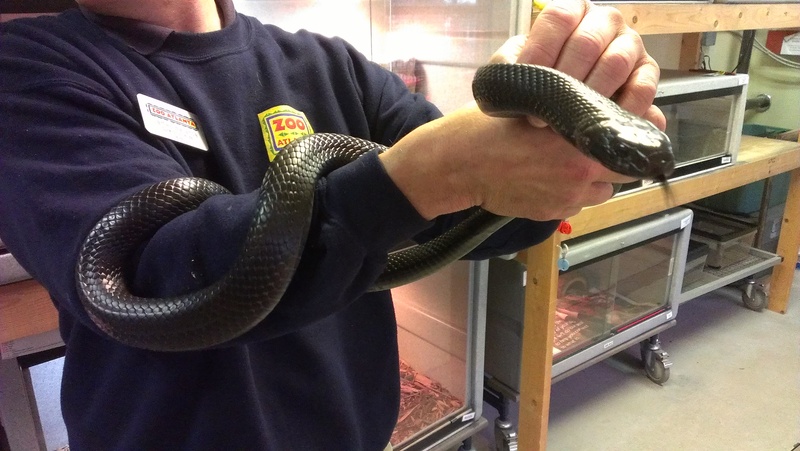 This is an indigo snake that was shown to us at Zoo Atlanta. This is one of their outreach animals. Most people don’t know that the Newport Aquarium is owned by a family company called Herschend Family Entertainment. 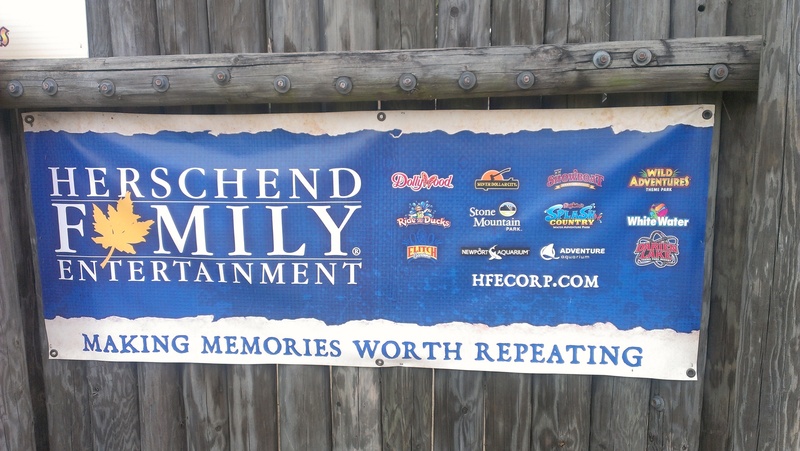 HFE sign that hangs at Wild Adventures in Valdosta, Ga. They are an amazing organization that owns many different entertainment properties around the United States, such as Dollywood, Stone Mountain Park, etc. 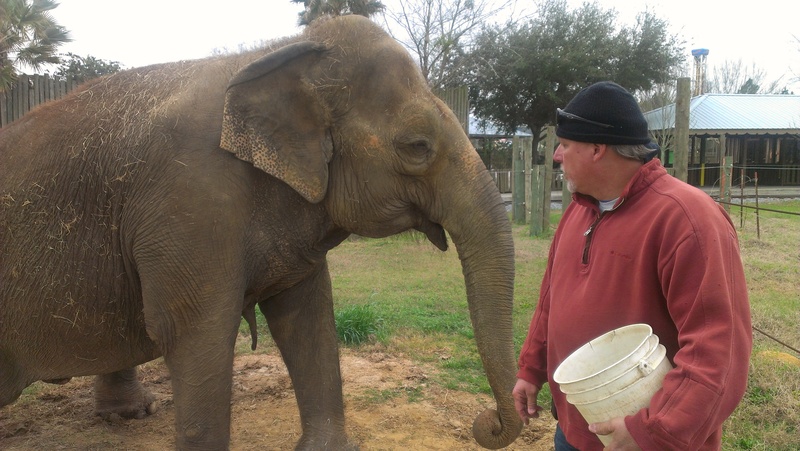 They also own Wild Adventures in Valdosta, Ga., which is the reason why we are here. Wild Adventures is the institution that is going to be taking our albino American alligators, Snowball and Snowflake. Ric wanted to stop by along the way talk to the future caretakers, see the enclosure options, and see if there was anything else that they needed from us to take the best care possible of the albino alligators. This is one of the options for an exhibit space that our white gators might be moving to. A very tropical looking exhibit! Chris Kilpatrick with his elephant at Wild Adventures in Valdosta, Ga.
About halfway through our visit at Wild Adventures, Ric got a call from Billy from Gatorland. Gatorland is the institution that is going to be taking our two American Alligators, Bert and Ernie. Gatorland would have been a further trip for us, so they were able to meet us in Georgia to make things easier. So we met Billy in the parking lot, and he and Ric prepared the animals for the next step in their journey. Bert and Ernie were two of the animals that I used the most for educational programs for the WAVE Foundation at the Newport Aquarium, and everyone who ever had the opportunity to work with them, or show them to a group of guests, loved them. I made sure to quiz Billy about “What kind of exhibit will they be in?” and “When can I come visit?” I know Gatorland will take great care of our animals, but it never hurts to ask a few pointed questions! 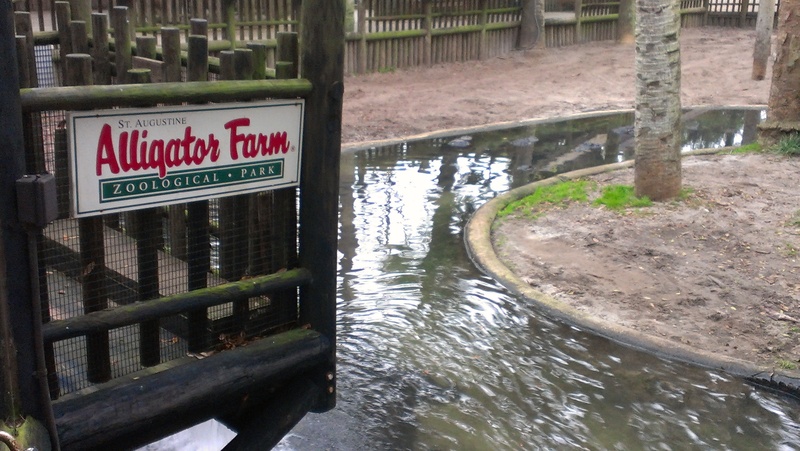 We then continued on our journey to St. Augustine Alligator Farm in Florida, and we are all out of crocodilians! We dropped off the last three animals (the tomistoma, the spectacled caiman and the dwarf caiman). We are going to be picking up a few animals in the morning to take back to Newport, but we are currently out of animals for the night. 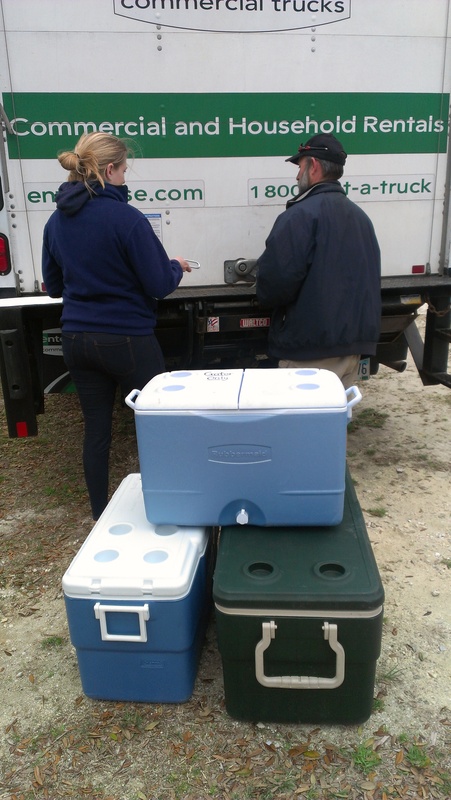 So that means… no moving the coolers into the hotel! Unloading animals for the last time at St. Augustine Alligator Farm. YAY! 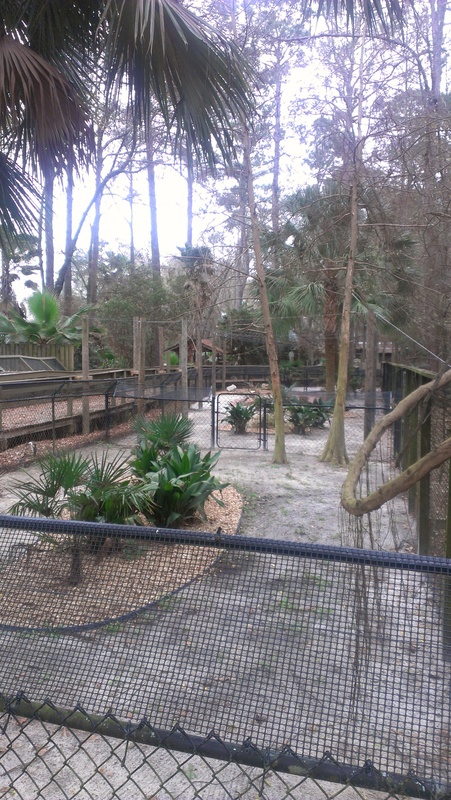 I am looking forward to the morning because St. Augustine Alligator Farm has all 23 species of crocodilians on exhibit! So that will definitely be crossing an item off my bucket list! 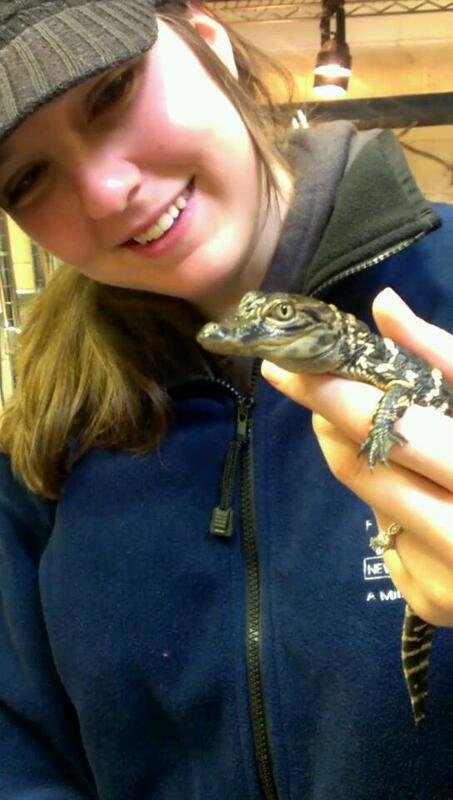 We will also be picking up the new crocodilians and heading to the Turtle Survival Alliance in South Carolina! And then… we will FINALLY meet Bravo! We can’t wait! This entry was posted in Uncategorized by NewportAquarium. Bookmark the permalink.